In 2008 we decided to remodel our Ojai home and guest house. After several general contractor interviews we chose Jeff Zimmermann of Z-Dwellings. The project went smoothly and Jeff’s knowledge of construction and his competent crew of carpenters, plumbers and electricians along with numerous specialty trades made the whole project a work of art. Jeff’s connections with local vendors saved us a lot of money and made the project run on-time and on-budget. In 2013 we moved to Ventura and again Jeff came through for us in upgrading the home we purchased. When it comes to home improvements our first call is always to Jeff and Z-Dwellings. "We are so pleased that we decided to use Jeff Zimmerman of Zdwellings for our commercial remodeling project. Every phase of construction went smoothly and seamlessly. Zdwellings has a very talented, reliable and honest staff of carpenters, plumbers, electricians and painters. Jeff's knowledge of construction and contacts with suppliers helped save us thousands of dollars and his relationship with city staff and our architect saved us valuable of time. Thanks to Jeff and Zdwellings our project was completed on time and on budget. Thank you Jeff and Zdwellings!" From start to finish the creation of our new kitchen was enjoyable and seamless. This is largely because of the ease of collaboration with Jeff. The process allowed for creativity and flexibility, while at the same time being kept on schedule and within estimated costs. The completed project is exactly what we had envisioned. 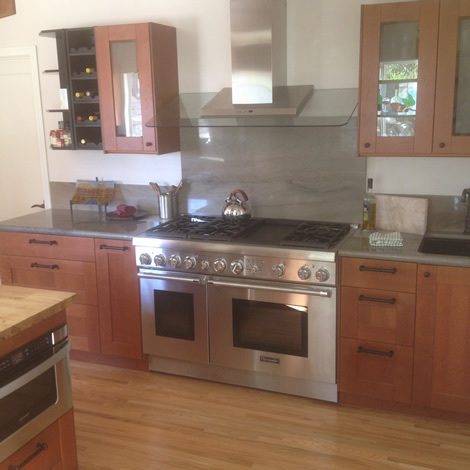 It is functional, beautiful and blends well as a new kitchen in a 1927 vintage home. We look forward to the bathroom remodel!